This cartoon was published in the Irish-language text book for adults, Enjoy Irish. The characters are saying: I’m tired – I’m in a bad mood – I have a headache – I have a stomach ache. 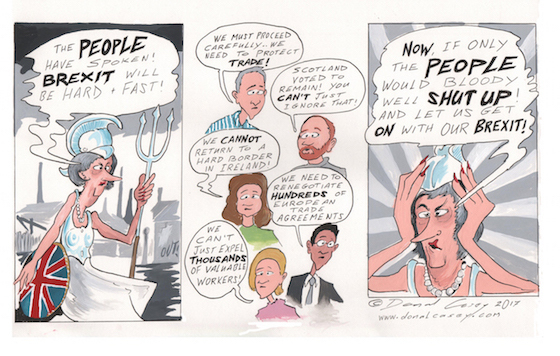 This cartoon was featured in the Irish-language text book Enjoy Irish. The bespectacled gentleman is asking “Are you playing much music these days?”. An example of specially commissioned caricature. This cartoon appeared in Work & Life, the magazine of the trade union Impact. This cartoon was published in the Irish-language text book for adults, Enjoy Irish; www.enjoyirish.ie The Gaelic squirrels are saying – 1. Come Here! – I’m going up! 2. I’m up now! 3. I’m coming down!